In the treatment of rare diseases for carriers of a genetic mutation, the aim of gene therapy is to insert a normal copy of the altered gene(s) causing this disease in order to replace the faulty gene(s). In Stargardt disease, the desired objective of gene therapy is to insert the ABCA4 gene’s healthy (or normal) DNA into the retina’s cells in order to restore the ABCA4 protein’s normal functions and to prevent deterioration of the retina. 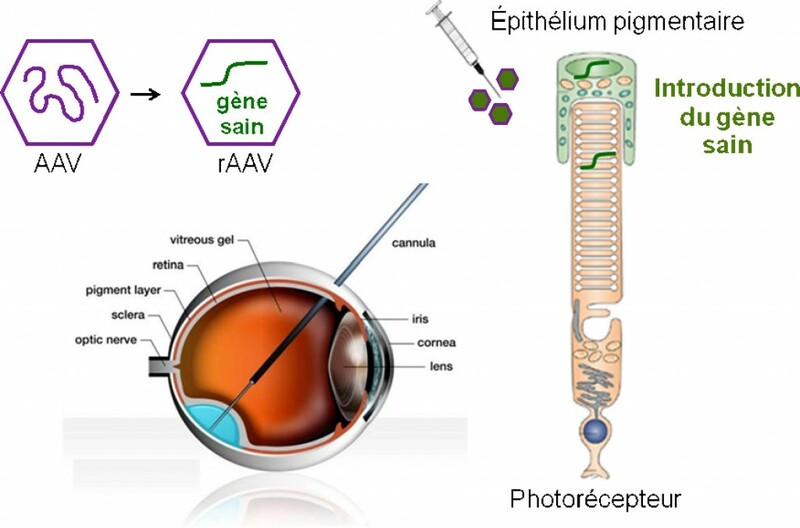 To insert this healthy gene into the retina’s cells, researchers use vectors which penetrate into the cells and transfer the healthy DNA into their nuclei. The healthy gene, located in the nucleus, can thus produce the normal protein. These vectors can be viruses stripped of their infectious, viral activity (retrovirus, adenovirus, lentivirus). The ABCA4 gene is too long and heavy to be entirely inserted into the vectors used in current research trials: this is a limitation with regards to possible insertion techniques. Another limitation is obtaining the correct functioning of these genes’ activity in the implanted cells. Research into gene therapy is a rising, encouraging line of research.